While there are more than a dozen varieties of the marmot all over the world, the Vancouver Island marmot is truly unique. They are easily distinguishable by their chocolate brown-coloured fur with white patches and are the only species of marmot found on the Island. 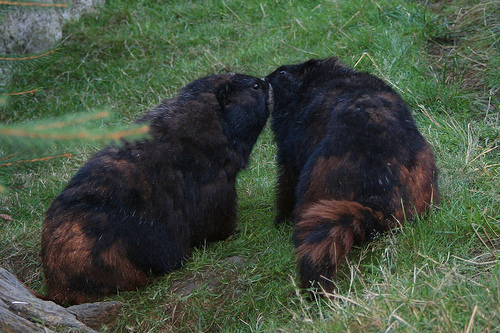 Because the Vancouver Island marmot whistles when it’s in danger, the species are also known as “whistle pigs”. The mountain ranges that run along Vancouver Island’s spine provide an environment full of sub-alpine meadows. 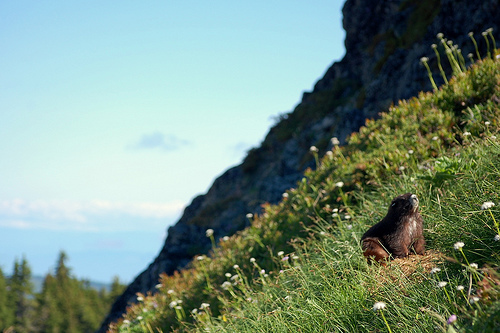 Since the Vancouver Island marmot lives in neither forests nor on mountaintops, meadows provide enough space to burrow for protection, as well as forage for the more than 50 different kinds of plants and wild flowers that this vegan species is known to eat. Adult marmots tip the scales somewhere around 12 pounds, so while larger than squirrels, they’re smaller than your average house cat. However, much like squirrels, the Vancouver Island marmot’s covered with thick hair and a fluffy tail, making them appear much larger than they really are. Like many animals of Canada’s wild, the Vancouver Island marmot hibernates for almost two-thirds of the year, emerging in late April or early May to reproduce. Most litters are born during the month of July, producing three or four new pups. Despite its critically endangered status, a number of initiatives have been taken to preserve the current population while encouraging it to swell back up to the numbers seen over 30 years ago. While some Vancouver Island marmots have been bred in conservation centres across Canada to be released back into the wild, more is being done directly on Vancouver Island to further this plan. The BC government appointed The Recovery Team, a group of scientists and wildlife managers from government, industry and non-governmental organizations, to develop and implement an intensive program. In 1998, the Tony Barrett Mount Washington Marmot Recovery Centre was established to reach the goal of 400-600 marmots in the wild. Today the population is on its way, having been brought back up to over 100. For more information on the Vancouver Island Marmot – and to find out how you can help support The Recovery Team – visit Marmots online. And remember, when encountering a Vancouver Island marmot in the wild (which isn’t unheard of during the summer months), you’re in their home and not the other way around. Keep quiet, keep your distance and respect their habitat. Don’t forget to take your garbage with you. I am curious though with increasing their numbers what sort outcome it will have. Yes it is nice to try to save the species but you have to be very careful doing it on an Island. Rodents can easily over populate any island in record times, especially if humans start interfering with natural selection. Since there is no where else for them to go but on the island, the more you breed, the more they breed, resulting in an island wide pest problem. As much as I love animals and hate to see numbers decline, it is also a part of natural selection and humans interfering with the problem usually only creates more. Ask yourself the question “If we have already invaded their territory, and we breed more, where are they going to be living?” … With less living spaces for these creatures they are going to start living in the urban areas which is unsafe for both the animals and for humans. They will start turning into the skunks, raccoons and squirrels that are plastered all over the roads here, all the while people will have animals burrowing under their foundations causing safety issues with their homes and yards. The interesting thing you pointed out is that cougars, eagles, and wolves are the main cause for their decline in numbers. What I find interesting about that is all three of those animals are ALSO endangered, particularily in that region. The population of cougars in that region has declined over 50% in the last 5 to 10 years leaving approximately 300-400 living. The islands wolf population has also decreased over 50% in the last 20 years, leaving approximately 150. Eagles have been endangered for as long as I can remember. Cougars and wolves are declining because of logging but also because there has been a decline in black tail deer… which is probably the reason for why they are now finding themselves having to feed on whatever they can get, thus being the marmot. Eagles numbers are decreasing because they too are losing their habitat but also the salmon population is decreasing. The salmon population is decreasing because of over-fishing. So if you REALLY want to try to save the marmot, instead of just breeding more you would HAVE to try to save the other species that are directly linked to the food chain. Save the salmon and other fish, you help many things in that one. Feed the eagle fish, it feeds less on marmots, put a ban on hunting black tail deer for a few years and let their numbers start to increase, you also help the cougars and the wolves, all the while saving the marmot. It goes much further than this. While I support and respect your cause it goes so much further past just trying to breed more. If they are at the bottom of the food chain then you need to take a look at the animals that are detrimental to it’s well being and save those first. @Marlee – I can appreciate the large amount of effort you put into this response, but I think you missed the point of this particular Island Profile. Saving the marmot is not my personal cause or large concern; the point of Island Profile each week is to spotlight a different aspect of Vancouver Island that is unique to the Island itself. Though that said, the Vancouver Island marmot is the single most endangered species in all of Canada and once it’s extinct, it’s gone forever. While I agree that all animals species on the Island should be conserved, we as humans also play a detrimental role in their decline. The circle of life will inevitably continue and the food chain will always be structured as it has through the history of this entire planet. However, fishing for and eating the salmon population is solely our own fault as humans for the decline. In terms of less living space for all of these creatures, again, this can be contributed to urban sprawl and the expanding of cities and towns. These animals have just as much right to live on the Island as we humans do, and to overrun their homes for our own purposes (whether new neighbourhoods or new ski resorts) is disrespectful to their right to be there too in saying that our needs supersede theirs. I by no means would ever deny that human activity is the main problem for most endangered species, but there are a few things that cannot be controlled right now. You (and many others) feel as though we’re logging just to move into their territory but that is a complete false perception at this time. There is a decline in all animals numbers, some more significantly than others. But we’re not expanding as much as one might think. While yes we have logged to build new neighbourhoods and resorts and have invaded animals territories in the past, there has been more logging these last 50-60 years just to try to save our forests and the animals living in them, than for our own personal benefits. There are many facts that you don’t know about the logging industry, and while you feel strongly about animals and their well being, I am equally passionate about our forests. The sad truth right now is whether we log or not, we’re losing our forests and the animals that live in them. Yes humans have logged to expand urban areas. There is no denying that. However, what you are not seeing is that logging is currently NOT being done to make money or new homes and resorts, logging is strictly being done right now to try to save our forests. In fact every board that goes through a mill is causing the company to LOSE money. We are not clear cutting our forests for our own selfish indulgence, we are cutting them down to try to fix what the pine beetle has destroyed. We are trying to plant new forests so that the animals have places to live again. We are trying to get rid of the dead trees that are polluting the earth with carbon dioxide and put us at major province wide risks for devestating wild fires. Right now this province is fighting to save the forests and everything that lives in them. Most of the trees that are being cut down right now aren’t even being used, most of them are being burned. The saddest truth right now is that the pine beetle are unstoppable and are killing trees faster than we can try to save them. Each tree that the pine beetles get into has 3 years left standing. Only after a year to 2 at the absolute max can that tree still be used for things like homes or cabinets etc. In their 3rd year that tree is dead waste that ends up being burned in slash piles. So yes species numbers are dropping in huge increments, but it isn’t because we’re expanding and being greedy, it’s because our forests are dying due to something that we cannot control. Right now our province is first and foremostly trying to use what they can of the beetle kill, they are not clear cutting anything they don’t have to. I am by no means trying to offend you or put anything you’re saying down. I just feel as though people don’t know all of their facts. Yes it is desrespectful to any and all animals to think that our needs supersede theirs, but I don’t think that is the case with what’s happening right now. @Marlee – I have to politely say that you’ve completely missed the point of this post. In only one sentence in the entire article did I mention the logging industry, and only to say that it has been a contributing factor to the decline of the marmot population. The chief culprits are cougars, wolves and eagles. It’s the circle of life – I get that. The Vancouver Island marmot population was around 300 in the 1970s and declined to such drastic numbers that action has been taken to ensure that the unique species does not become extinct. All the group is trying to do is bring the population to a healthy number to ensure their survival – not so they will overrun the Island. That is the only point I am trying to make. My last comment was in relation to this particular sentence from your last comment: “In terms of less living space for all of these creatures, again, this can be contributed to urban sprawl and the expanding of cities and towns.” which lead me astray from the original post. That is all. I apologize that it did stray from the original post. I understand you mentioned that the chief culprits were cougars, wolves, and eagles. I also mentioned that in my first comment. If they do breed more, sure they’re probably not going to overrun the island, but will they be able to survive even with higher numbers? If they’re dropping off this quickly in a matter of 40 years, it would be safe to assume that with their habitat still declining and them still being eaten, that 40 years from now they will be yet again nearing extinction. Yeah? So what is the thing that IS happening right now then? Pot Kettle Black, get your own facts straight. So basically in your highly informed experienced opinion just let them die off now because in 40 years they will be dying again. Don’t try, give up! You are so thoughtful and wise! Can we see more pictures of Jordy now? Keira-Anne you’ve written an excellent summary on the Vancouver Island marmot and recovery challenges, better than most journalists actually and I applaud your idea of featuring causes you care about each week in your column for those interested in helping the world become a better place. I’m sure you’re more familiar with this format than I but I fear you will often find faint praise for attempting to do the right thing. That doesn’t mean you should give up, as a matter of fact it’s as good a reason as any to persevere, but you’ll likely get more responses from the generally uninformed or sour grape experts than supporters. This is a technology of equality for all – and that is unfortunate most of the time. Vancouver Island is in absolutely no danger of being overrun by Vancouver Island marmots. This species of marmot has evolved to live in small patches of niche sub-alpine habitat that remains pristine to this day, which means they are one of the few endangered species with a very good chance of recovery – given that chance. Because they have limited natural habitat they do not breed like rabbits and instead have relatively small litters of 3-5 pups every other year after age 2. Otherwise they would have overrun their habitat long ago, which would not have been a very effective evolutionary move. It is the hope that once the VIM population reaches the recovery target of approximately 600 marmots in the wild there will be enough established breeding pairs to withstand predation and still sustain the population, like they previously did for tens of thousands of years. 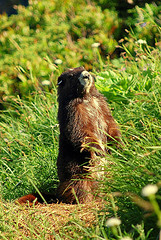 There is a chance that because of alterations to lands surrounding marmot habitat, for all kinds of reasons and purposes, as well as invasions of foreign species (rabbits for instance), predator levels may again increase to the point it causes a problem for the marmot population, which means they may require an occasional influx of captive-born marmots to keep their numbers healthy. Would releasing a few captive-born marmots once in awhile to supplement the wild population be as bad as allowing one of our only uniquely Canadian species to slip into the extinction pit? I hope not. The point is, until that point of 600 VIM in the wild is reached no one can tell you what will or will not be needed. What we can say is that with continued success in the captive breeding program and continued releases to the wild – it looks like it can be reached. Given the will to do so. None of the predators you listed are endangered. Some believe there was a sub-species of island wolf but I believe it is common consensus that species has long since disappeared because it was overwhelmed by the immigration of mainland wolves to the island. Please verify everything I say, I do not want to assume I know better than anyone or cause more rants like those above. I do want to congratulate you on your endeavor though and wish you luck in a world full of people with nothing better to do than knock each other down. @Marlee – Ahh the good old VI Marmot debate. As the photographer for those pics up there I just have to weigh in on this. I am not a marmot expert, but I am a UVic biology grad. predators. Also, the typical marmot habitat is sloped alpine areas between 800-1500m in elevation, they prefer deep soils where they can build burrows to hibernate over winter…this would be difficult to do in a parking lot. Even if they did change their natural behaviour and occupy other habitats they would get wacked by predators. In fact, this is what happened when the marmots tried moving into clearcuts… they couldn’t hide in burrows and they were easy picking for wolves, cougars and eagles. 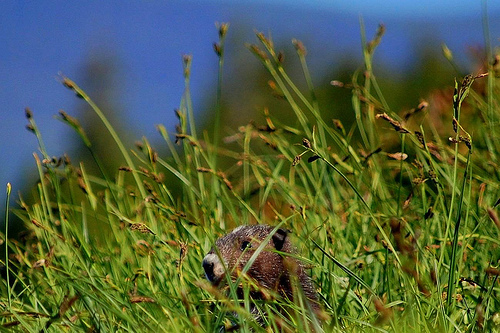 The plump and juicy marmots are not built for running away from predators (like deer), all they can do is hide. – True… dumping a bunch of marmots in the wild is not the end of the story. But I think that maintaining these new populations does not just depend on predator populations, habitat is the big issue. If the marmots would stay up in the mountains and not be temped to come down to clearcuts, and if we didn’t build logging roads up into the mountains which allow easy access for cougars and wolves, they would be fine. And by the way, Bald Eagles are not endangered, their status in BC is “Least Concern” and there numbers have been going up since the 60’s. – The Pine Beetle epidemic is on the mainland not on Island! (see map: http://mpb.cfs.nrcan.gc.ca/map_e.html). Your statement is true for the mainland but it is not an excuse for the destruction of Island forests. There has been small outbreaks in the South Island in the past but it is not a current concern. The logging is for profit not for saving the forest. Sorry for the rant Keira-Anne, I know some of these agurments are beyond the scope of your article but I couldnt resist. I appreciate Matt Dil’s answers to the questions I posed. The whole logging thing was more so directed to the fact that it’s posing threats to many and all animals province wide, it wasn’t strictly directed towards the marmot. It was off topic yes but I went off on a tangent. I feel I have to argue your comment of “The logging is for profit not for saving the forest” because as a person who has worked strictly in the sawmill/trades related industry for the last 4 years I have seen and felt the direct effects of the fall of the lumber industry. I am from a remote northern town who’s main source of income is timber, and I will tell you that in the last year and a half approximately 50% of people working in the forest industry have lost their jobs because timber is no longer making money. It is actually costing the companies money for every board they produce, they are NOT making a profit at all right now. Companies that are still producing lumber are doing so at their own risk of losing their company. Countless mills have been shut down province wide and have been forced into bankruptcy due to the situation of the lumber industry. The devestation of this drop started because wood has lost it’s value due to the fact that pine beetle had destroyed it. Wood, even though still okay to use, is left with a blue stains/tints after it has been infected and sadly it’s just “not as pretty” so no one wants it. Also there is such an abundance of it and no demand. Factor in the economy’s downfall and no one is buying anymore. International mills are the companies that are effected the most right now. So even if the Island forests aren’t being destroyed by the pine beetle the Island will still be affected by what’s happening throughout the rest of the province. They will still be logging, but I would bet that due to the nature of the lumber industry that they are not logging as much as they once were. That being said the other points you have pointed out I don’t disagree with one bit.